H-1B VISAS -- Here Today .... Gone Today! Albert Einstein once famously said, “I never think about the future. It comes soon enough”. It’s good that people like Einstein never worried about tomorrow. Perhaps such pedestrian concerns are better left to the rest of us. Certainly, for the many thousands of non-immigrant professionals and specialty workers who will not be able to work lawfully because they never even had a chance to apply for the H-1B visa this year, the future is a big concern. Actually, even those who were able to apply have cause to be concerned. I, too, am very much concerned as well. I have clients whom I may have to face soon enough, and to whom I may be saying – “I did my job. I filed you on the very first day, but you didn’t make the cut. The computer didn’t pick you”. I’m so sorry.” For now, at least for this very minute, I will try to be like Einstein and not worry about it. That day will come soon enough. USCIS announced on April 3, 2007 that it received enough H-1B petitions to meet the congressionally mandated quota for the 2008 fiscal year, which begins on October 1, 2007. In fact, the quota was met and exceeded the very first day of filing, on April 2, 2007. The very same day the doors were opened, they were closed. And actually, those who think they made it in, may not really be in at all. We won’t even know until a computer-generated random selection process determines who made it in, and who’s out of luck. Such a determination will be made weeks after receipt notices will have been generated for all cases received on April 2 and April 3 (the day the announcement was made). Yes, you read right. Let me say it again -- even though you receive a receipt notice – your application may still, in the end, be rejected. That is, if you are not one of the lucky ones picked by the computer. Only 65,000 cap-subject H-1B visas are allowed in a given fiscal year. Add to that a specially carved out allotment of 20,000 H-1Bs for those with U.S. master’s degrees. As of late Monday afternoon (April 2), approximately 150,000 cap-subject H-1B petitions had been received. The government also accepted applications for April 3. Add those to the 150,000 received on April 2. Petitions received on both those days will be allowed entry into the “lottery” and announcements will be made in the weeks ahead. So, the way I figure it, allowing for a conservative estimation of total numbers received, if your petition got there on April 2 or 3, you have about a 1 in 3 chance, maybe 1 in 4……maybe one in 5? U.S. businesses use the H-1B program to employ foreign workers in such specialized fields as engineering, computer programming, architecture, the sciences. 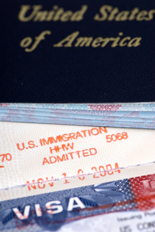 Foreign workers use the H-1B program as a means to a better life, as a way to live and work in the United States, to bring their families to this country, as a way to possibly obtain a green card in the future. What we have here is obviously a disconnect between the law as it exists today, and the changing needs of today’s employment arena. The world is flat, after all. Or hadn’t you heard? So it would seem logical, then, that in the coming weeks, maybe months, something will be done about this “crisis”. It would seem logical, you would think, that if something is amiss with the law, that people like you and me would try to do something about it, that we would urge our congressional representatives to see this “disconnect” for what it is and make the necessary changes. But laws don’t change overnight. In the meantime, what do we do? If you are here on a B-1 or B-2 or if you are student currently on practical training, or a new graduate, and you were counting on changing your status to that of an H-1B, you may or may not like the idea of having to ride out this period of not knowing, of waiting for a computer to determine your fate. Think about alternatives now, while you can still do something about it. 1. Not all H-1B petitions are subject to the cap. If you can possibly be sponsored by a company that is not subject to the cap, try to get such sponsorship now! What kinds of companies are not cap-subject? or that Ph.D. you had thought about pursuing, or how about that second bachelor’s degree that you wanted to go for in the first place but didn’t because your parents thought it wasn’t practical? 3. In the alphabet soup of U.S. visas, the H-1B is certainly one of the most widely known and most highly pursued visa. But it is not the only one. Could the J be for you? How about the H-3? Or the O? the P? Heck, maybe even the R? Possibilities and options abound. Do some research, ask around, ask the experts. The H may have been the most logical choice, but it is not necessarily your only choice. Whatever you do, do something. If you have a lawyer and they filed the H-1B on your behalf, make an appointment now to see him or her, and talk about alternatives. Maybe a different visa category, perhaps? Or how about this? Out of all the non cap-subject H-1B options, I like the “entities related to or affiliated with institutes of higher education” the most. I mean, “entity” can be just about anything; “related” is so broad; and “affiliation”, however tenuous, is still that, an affiliation! Maybe, just maybe, that company you thought was cap-subject, isn’t cap-subject after all! Maybe I am going off on a limb. But it doesn’t hurt to revisit old assumptions, just in case they were wrong. It doesn’t hurt to revisit previously disregarded options, just in case they don’t look as bad as waiting around for a year…..in a foreign country. Doing nothing now will mean that if you don’t get picked in the coming weeks, you will have to wait around until next year, when the new fiscal year starts. Maybe, just maybe, the computer will pick you then. But then again, what if the U.S. company that sponsored you now won’t want or need you next year? This too, shall pass. But I doubt that many of us can afford to sit passively and wait a year before going forward with lives and plans. Let us put our thinking caps on and plan ahead. I guess I can’t afford to think like Einstein after all. Can you?